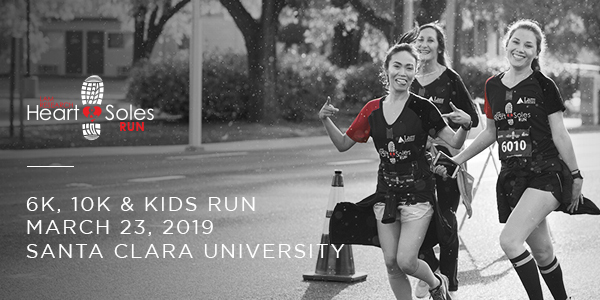 Join the 2019 Lam Research Heart & Soles Run on Saturday, March 23 in Santa Clara, California. Founded and produced by the Silicon Valley Leadership Group Foundation, this family-oriented run/walk is dedicated to helping local children engage in healthy exercise and to make better food choices on a daily basis. Starting at the historic campus of Santa Clara University/Mission Santa Clara, the course features a festive loop through Avaya Stadium, home to the San Jose Earthquakes! The event then returns to Santa Clara University where participants can enjoy a post-race festival on Santa Clara’s Franklin Mall. The course includes The Health Trust 6K, San Francisco 49ers 10K and Sutter Health/PAMF Kids Fun Run with dash distances (ages 2 – 7). Funds raised through the run will be used to promote increased physical activity and access to healthy foods among the student populations they serve. Boys & Girls Clubs of Santa Cruz County is a beneficiary of this run! You can find out more information here. Register for the event here! Use our code BGCSCLam for a complimentary registration for one person.